Anything you do regularly takes on layers of meaning. Running regularly certainly gives you time to think, and to find meaning in simple things and perhaps in things not so simple. 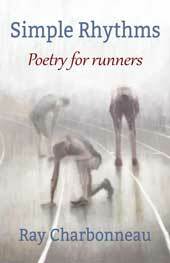 In Simple Rhythms, Ray Charbonneau finds poetry in motion, the simple and basic motion of running. From the Boston Globe, Ultrarunning, Marathon & Beyond, Level Renner, and other publications.